I think of myself as minor expert on canning and preserving books. In addition to having written three of my own, I have a working familiarity with nearly everything that’s out there and so whenever I’m asked to recommend books for specific purpose, I flip through my mental file and offer up a few options. Need help with small batch fermenting? Amanda Feifer’s Ferment Your Vegetables is the best option. 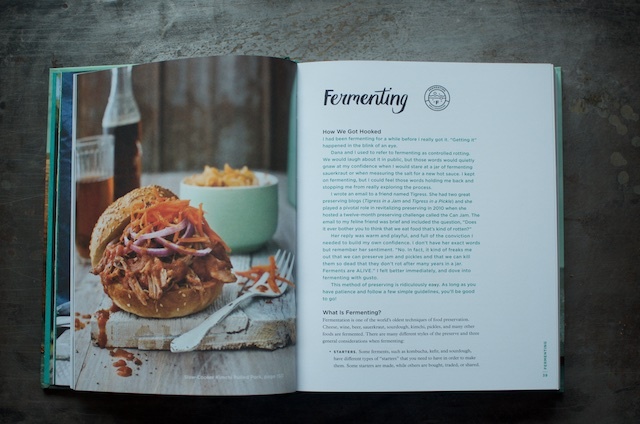 Looking for thoughtful recipes with a modern, Southern twist? Kevin West’s Saving the Season is for you. Domenica Marchetti’s Preserving Italy will help you recreate your Italian grandmother’s pantry. And Karen Solomon’s Asian Pickles is brilliant and self explanatory. 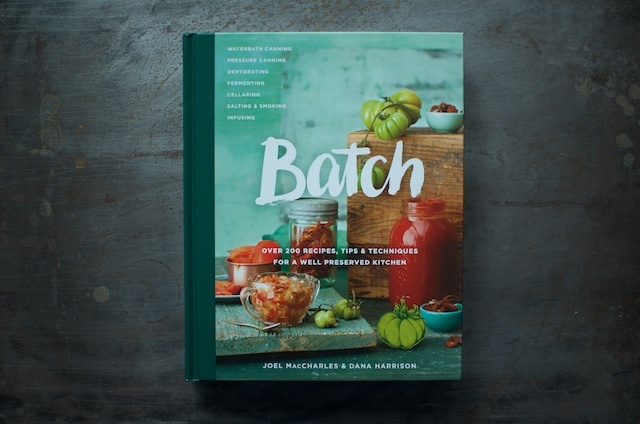 I’ve also found myself suggesting Joel MacCharles and Dana Harrison’s new book Batch a great deal lately (if their names sound familiar, it’s because they are the bloggers behind the website Well Preserved). This book is essential for anyone who wants a huge, exuberant, smart, gorgeously designed, and vibrantly photographed book that deals with seven styles of food preservation, offers recipes for using the food you’ve preserved, and helps you make the very most out of every scrap of food you grow, buy, and forage. I particularly like how they’ve structured this volume. The first quarter of Batch is designed to help you build the skills you’ll need in the balance of the book. 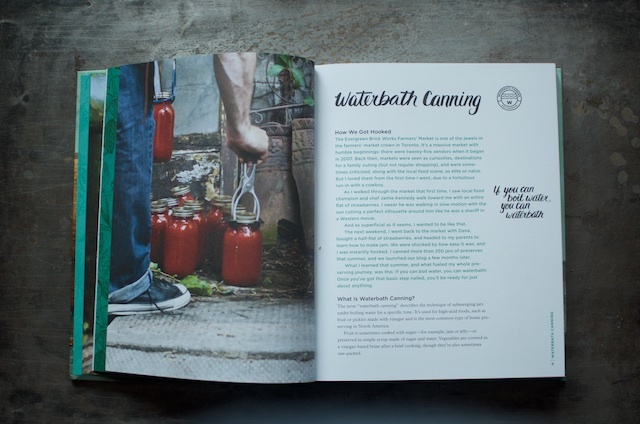 It’s here that you’ll learn about waterbath canning, pressure canning, dehydrating, fermenting, cellaring, salting & smoking, and infusing. Joel wrote the bulk of the book’s text and his writing telegraphs calm knowledge and reliable expertise. 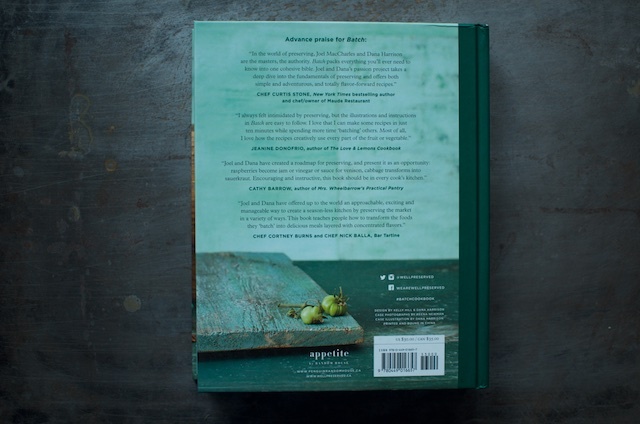 The remainder of the book is organized around 25 ingredients, laid out in alphabetical order. 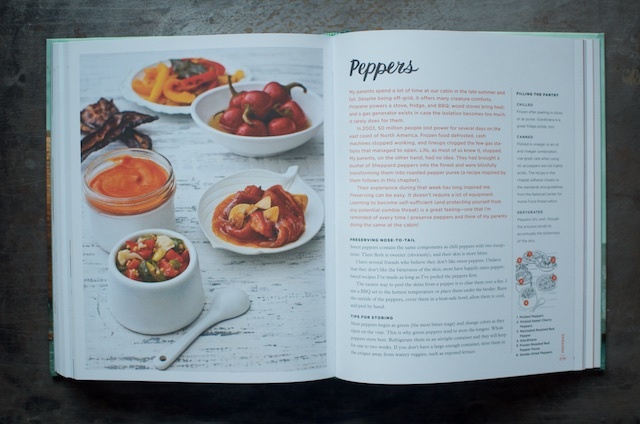 Starting with apples and ending with tomatoes, each ingredient chapter helps you make the very most of seasonal produce with recipes to preserve, store, and consume. One of the brilliant elements in this book is the Batch-It approach. The recipes are grouped so that it becomes easy to make two or three things in concert with one another rather the traditional approach that silos each project. I find that having read my way through this book, I now am constantly thinking about how I can couple my preserving activities. Another thing that makes this book so uniquely useful is the way in which the recipes for using the preserves are nested into the ingredient sections. 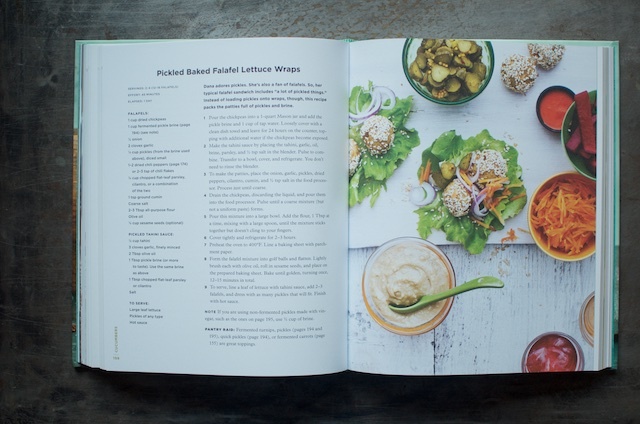 Some put the preserve to work as an active ingredient and others demonstrate how a side of sauce or chutney can easily enhance a simple plate. 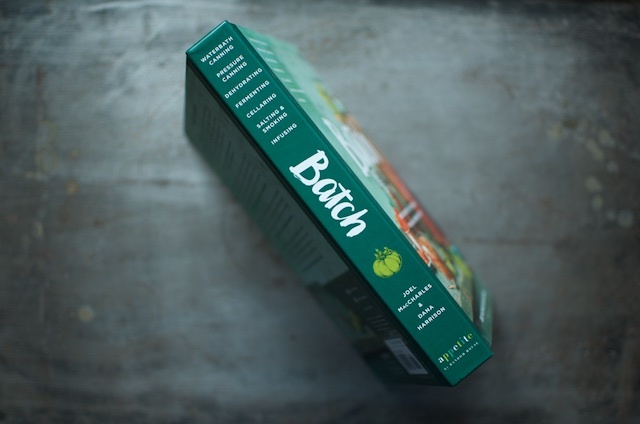 Along with being a reliable and useful resource, Batch is a pleasure to glance through. Dana is an artist and designer, and both her creative eye and her work are found throughout Batch’s pages. Every time I open it, some new element catches my eye. If you’re an avid canner and you’ve not added it to your bookshelf yet, I highly encourage you to add it to your wish lists and shopping carts! Disclosure: I bought the copy of Batch you see pictured above. I count Joel and Dana among my friends, but the opinions offered here are offered on the basis of their exceptional book, not our friendship. This book sounds great, quite organized. easy to navigate. that is always a treat in my kitchen.I also really appreciate the recipes included to use the items made. That alone is an immense help. Thank you for all of the references here also. I’m looking forward to checking them out. I’m somewhat new to canning on my own and it’s always nice to find inspiration to try new things, especially when it comes from a respected source. like you. Looks good. I wish however that the hardcover books coming out would have a nice spiral binding – so much easier to use in my opinion. That being said… I’ll prob buy this one looks good and is always helpful for teaching as long as info is sound. I actually met you at Joel and Dana’s kitchen party on Toronto’s waterfront in 2014. 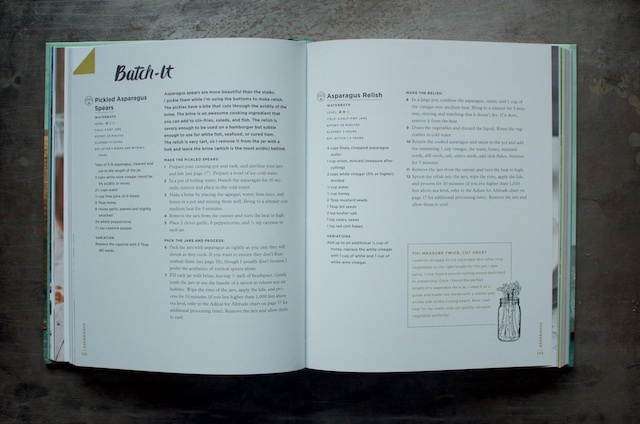 Their book is really great, and you are so right about the ‘batch it’ section — it’s not something you always think about, but a great way to vary your preserves. I love your books and the books you recommend. I have bought all your books and often use them and some times grow things to can. It is truly a wonderful experience. Thank you Marisa for all you do… and love your work! !